There are several things about the layout and appearance of a blog, as well as accessibility of social media following options, that I always take notice of when visiting other blogs. They are things that guide my own blog layout, and therefor, I obviously like. Some things are my personal preference (but my preferences are right! ), others I've noticed on obviously successful blogs, and then some I have taken under advisement from other credible sources. Uh, yes, I am a credible source too, gosh darnit! It makes sense to want readers to find your blog easy to navigate. The last thing you want is to have someone get frustrated and click away when something compelled them to come in the first place, right? Besides, if you're not writing to be read and interacted with, why are you writing on the Internet? 1. Do you have flashing, scrolling or noisy widgets that could overstimulate, overwhelm and distract readers from your awesome content? If you do, I suggest rethinking them. I have heard from many bloggers that these sorts of things turn them off, and I have to agree. Strongly. 2. 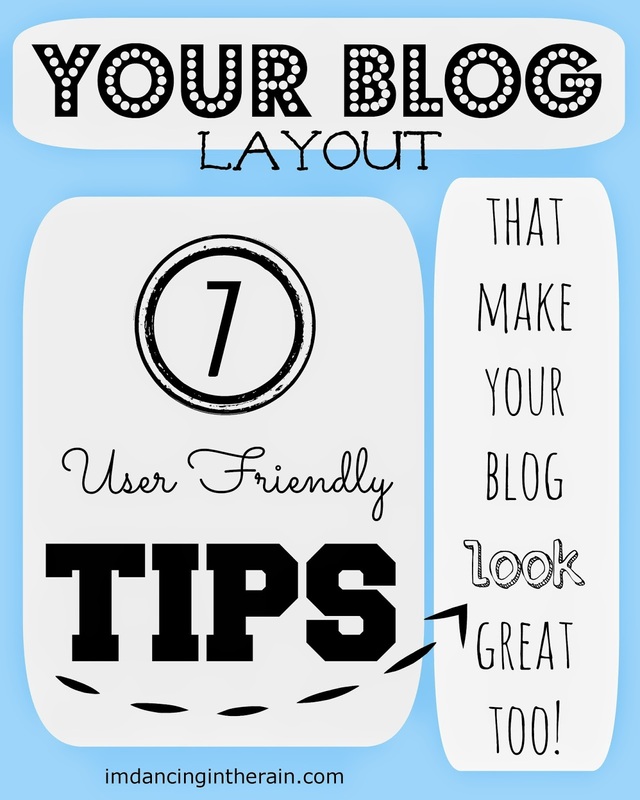 Is your blog cluttered with every sort of button you can squeeze into your sidebar? You should be choosy about which buttons, links, images, widgets/gadgets, ads etc. you include in your sidebar and footer. You want each one to be relevant to your blog in some way, to convey something that matters to you or information you think your readers would like to see. Also, I personally feel they should be formatted neatly and inline to the best of your ability. A messy blog is hard to follow because readers may not be able to discern WHY they should follow you. Think of the things you include on your site (other than your content) to be accessories for your content. 3. Speaking of sidebars, is yours on the right or left? I think sidebars should be on the right. This is because we read from left to right. I don't know about you, but I get a little confused whenever I'm on a blog with a left sidebar. I do not recommend two sidebars. 4. Is your color scheme pleasing to the eye? It is highly recommended that at least your post area be on a white background with an EASY TO READ font and font color. I cannot emphasize this enough: you want your content to be easy to read! You don't want readers squinting, hunting for the zoom option in their browser or getting a headache from reading your blog. Chances are they won't finish and they sure as heck won't be back. 5. Are you using Captcha or some other form of word verification in your comments? If you are, stop it. It is probably the number one reason a reader will opt not to comment. You're making it hard for them! I happen to know that both Wordpress and Blogger have pretty good spam filters. Please don't make your readers jump through hoops in order to leave you a comment. Furthermore, if you aren't already, you might want to consider installing a third party commenting platform such as Disqus or IntenseDebate (to name a couple). Two major advantages to not using your default comment system (especially on Blogger) are: 1. Email notification of your replies to comments and, 2. Integration with social networks which can drive more visitors to your site. I was hoppin' mad when I discovered that my replies in my Blogger comments were not being emailed! 6. Are your social media follow options easy to find? I personally prefer a set of social media follow buttons, similar to the blue ones I'm sporting here. Others will use separate HTML widgets they installed from the various SM sites they use. I find that more tedious to scroll through and click on. Also, sometimes they're not all together, like one after the other, but randomly installed in the sidebar. This makes more work for me and I may not have time for it, thus making me less likely to give you a follow. There are many, many, many free social media icons available to download, as well as many tutorials on how to install a set of social media icons (Google these things). There's even a social media button maker. Easy-peasy! 7. Do your posts include a set of sharing buttons? Again, why are you writing on the Internet if not to be read? You want those who read and like your posts to share them so that others will come and read too. People will share your content if you make it easy for them. It's kind of a thing. So, choose a sharing widget such as AddThis or Shareaholic (just suggestions), sign up with all your bloggy info and install that bad boy. Do at least one of these things on your blog, then come back here and leave me a comment telling me what you changed with a link back to your site so I can check it out. If you do more than one of these tasks, let me know, and I will give you a Twitter shout out (if I can easily find you)! 3. Install a new comment platform. 4. Install a set of social media icons. 5. Install a post sharing widget. Tweet me if you need help. Good luck and have fun! Something to add? Do you disagree with me on anything?